American cities like NYC and Las Vegas may be full of glitzy neon signs, but I have to say they don’t compare to the collection you’ll find here in Warsaw. Yep, our Polish capital is home to the Neon Muzeum which is dedicated to the preservation of Poland's Cold War-era neon signs. 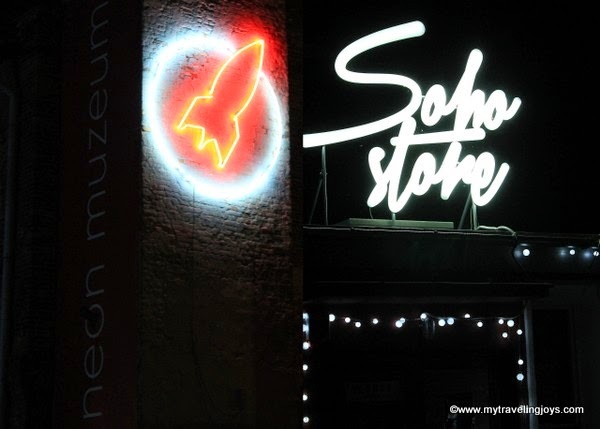 Opened in May 2012, it is one of just a handful of neon museums in the whole world. The museum is located in the Soho Factory, an old factory that now houses galleries, restaurants and design shops and hosts special events in up-and-coming Praga, a neighborhood on the eastern side of Warsaw. 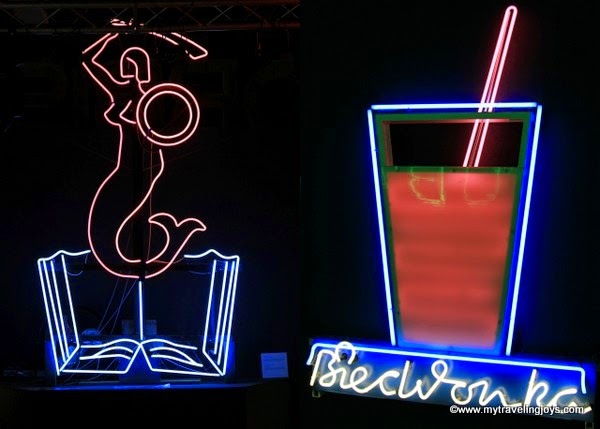 Awhile back, we visited the Neon Muzeum as part of a group tour and saw how creators, David Hill and Ilona Karwinska, have collected more than 50 neon signs from around Poland. 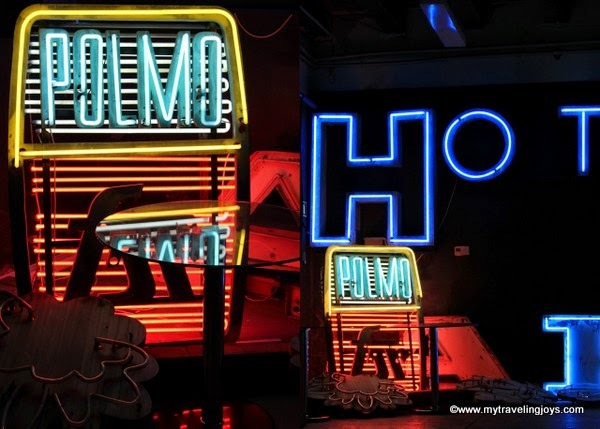 The duo first collaborated together on a photography book, called Polish Cold War Neon in 2005, and the idea to preserve these now very fashionable and retro neon signs developed. Inside, you’ll find more than 500 letters in various fonts preserved from old Polish cafés, libraries, pharmacies, stores, train stations and even the former National Stadium. Some shine bright, while others wait for restoration until funds become available. During the Cold War era, these neon signs were designed and made by architects, graphic designers and artists as part of the state-run Reklama, a graphic design company that ended up creating more than 1,000 of them. One such sign is “Berlin,” dating from 1974, which served as a textile company, a gift shop, and a household appliance store. Reklama designed the sign and ended up repairing it nearly 40 years later for the museum. I loved exploring this trendy museum! You can’t help but wonder how these bright, unique signs once lit up the otherwise drab Communism landscape in Poland. What stories could be told if the signs could talk? Next to many of the signs you’ll also find brief descriptions. Left: “Syrenka” (Mermaid) is the symbol of Warsaw. This neon sign from a Public Library, dates back to the early 1970s, in the Ochota district. The symbol and letters were removed during a renovation and then donated by the library to the museum. Right: The “Bar Biedronka” (Ladybird Milk Bar) was designed in 1969. Milk bars were very popular as affordable social eateries post WWII and have now become fashionable again. There are several locations in Warsaw. Restauracja Szanghaj was once located at Marszałkowska 55/73 in Warsaw. Hopefully, neon will continue to appeal to future generations. After all, neon is a pretty cool form of visual communication. Stop by the museum and check it out for yourself! Open: 12-17 Wednesdays to Saturdays; 12-16 Sundays. If interested in buying memorabilia, check out the Neon Muzeum Online Store. i love neon signs in cities. for some reason my city hates big signs. so we have a pretty big city with very tidy little signs. it's weird. We used to be a bit sniffy about neon, it's amazing how it is now so cool. @Joyce, to each their own, I guess. And I bet my hometown maybe only has like 2 or 3 old neon signs! I love signs like this! They remind me of Times Square, which is home (NYC) for me. You don't see too many signs like this outside of big cities in France. I'll have to get to Warsaw one day! 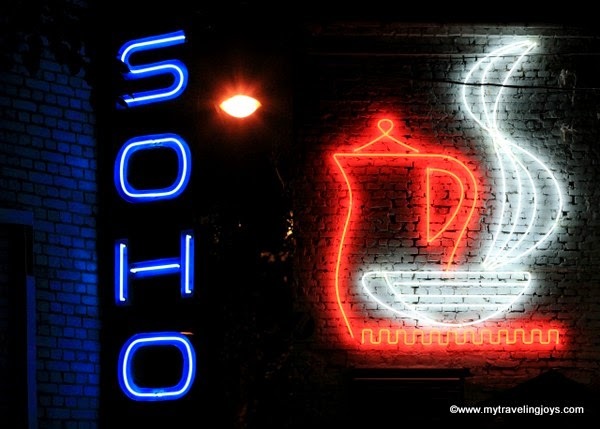 Nice collection of Neon Signs, Which you have shared in this post. These all are very beautiful and I liked all of these. If anyone looking for the Neon Sign Company in Dubai, Al Rizq Advertising is the best for you.